This dissection of Lettering includes an assessment of each of the book’s sections and subsections. This is done because the book has its good points despite the many complaints enumerated below. The rating system (using asterisks as stars) is based on my notion of how each lettering process should be shown. Following the overview of each of the sections is the more usual dissection of the book focusing on orthographical and typographical errors; and some comments on its typography and design. 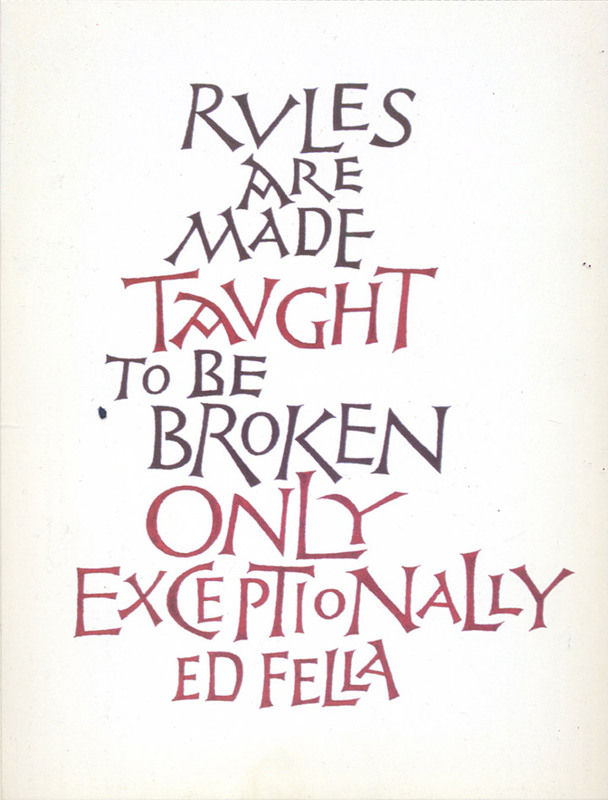 See an example "Ed Fella Rules"
I am a lettering artist in the Chicago area. I have been creating custom lettering about 30 years professionally for clients in advertising agencies, marketing, packaging and branding firms. He's not kidding. You'll find some wonderful works of lettering at his custom lettering blog. The London Underground secured a place in the pantheon of good graphic design with engineer Harry Beck's topologic Tube Map from 1933. Seriously? There are so many font experts online you'd never know the same rules have ruled for a century!